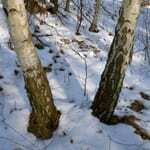 Silver birch is a pioneer tree. That means it is one of the first trees to colonise new (or cleared) land. It grows widely across the UK preferring a drier, sandier soil then downy birch. This often means downy birch is the more common birch in Ireland and Scotland and at higher altitudes. The silver birch has pointed, triangular leaves. 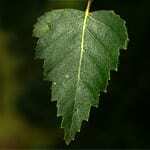 The edge of the leaf is doubly toothed (unlike the downy birch which is singly toothed). Silver birch has both male and female flowers (catkins) on the same tree. 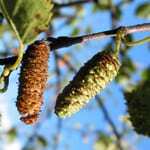 The male catkins are formed in the autumn and will remain on the tree all winter – only opening in April or May. The female catkins appear in spring with the new shoots. The seeds are dispersed by the wind. They are tiny nutlets (only 2-3mm across) with two wings, helping them to travel up to one mile from the parent tree. 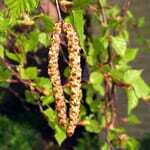 The female catkins, where the seeds develop, eventually disintegrate in September and October, releasing the seeds. One tree can produce many thousands of seeds each year. 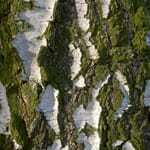 The bark is whiter than downy birch with scattered black fissures. The young twigs are typically covered in white ‘warts’, and feel rough to the touch. The bark becomes much more rugged with diamond shaped crevices as it gets older. 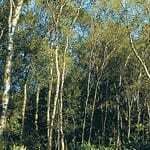 Silver birch tolerates the cold well and prefers a light, dry and acid soil. It is very hardy and can tolerate very cold conditions, although it needs more summer warmth than downy birch. Silver birch grows in woods and on heathland.